The district police today arrested 14 members of a gang of robbers, who, after committing robberies in moving three-wheelers, were planning train dacoities. The SGPC has decided to observe the 500th birth anniversary of Guru Angad Dev on April 18, 400 years of the installation (Parkash) Day of Guru Granth Sahib on September 1 and 300th Martrydom Day of the four sons of Guru Gobind Singh from December 21 to 26 this year. Even as the deadlock over the headship of the Nanaksar Ashram Thath continues and the administration has imposed Section 144 of the CrPC, two Akhand Paths were initiated to celebrate the birth anniversary of Baba Meehan Singh, the founder of the trust, which falls on January 13, at different places. 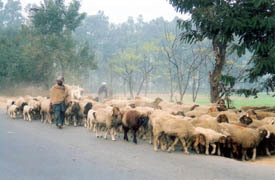 Even as the much-hyped campaign to remove 9,000-odd encroachments on government and municipal land in the city, launched on the explicit directions of the Punjab and Haryana High Court, had run into rough weather for several reasons, residents in many of the colonies were also raising their strong voice of protest against indiscriminate action as far as issuing notices by the building branch of the municipal corporation was concerned. Mr Gurdeep Singh, the owner of a furniture showroom here, has alleged that one Dupinder Singh had defrauded him of Rs 5 lakh. He has lodged a complaint at the city police station in this regard. A convention to pay homage to Harbhajan Halwarvi, an eminent poet and former Editor of Punjabi Tribune, was held at Punjabi Bhavan, here today. It was organised by the Adabi Daira and Cooperative Media, Mullanpur. Accidents normally take place due to the carelessness of the drivers of vehicles and lack of awareness of traffic rules among the drivers of tractor-trailers which have no reflectors fixed on the back of their trailers said Mr M.P. Arora, Additional Deputy Commissioner, Fatehgarh Sahib. Senior Akali leader and former minister, Mr Daleep Singh Pandhi, in a communication, has sought the attention of the Prime Minister for the construction of a post office building here. The Vice-Chairman of the Planning Board, Punjab, Dr S.S. Johl, today welcomed the special Rs 50,000 crore package for building up agricultural infrastructure. “Any package (for farmers) is welcome”, he told The Tribune, while remarking, “but it is the timing of the package that should be kept in mind”. The birth anniversary of Swami Vivekanand will be celebrated in Ludhiana tomorrow. A number of functions have been planned to mark the occasion. 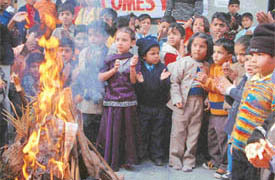 The main function would be held by the Swami Vivekananda Study Circle Ludhiana. Positive thinking is an important tool that can help view life more objectively. In our day to day life, we are used to focusing on what we do not have, more than on what we have. It is important to learn how to see the glass half full instead of half empty. Attitudes of appreciation and thankfulness are very beneficial psychologically. Be content with having your basic needs met, because that and everything else you have are gifts that not many enjoy. The Apex Chamber of Commerce and Industry, Punjab on Saturday criticised Finance Minister Jaswant Singh for not granting relief to steel users but rather helping steel-makers. Noted industrialist and the Chairman of the Hero Group of Industries, Mr Brij Mohan Lall Munjal, has been conferred with the Padma Shree award. A communication to this effect has been received from the Union Government by the Hero Group. He is being honoured for his outstanding contribution to the country’s industrial growth and economy. The Punjab Small Industries Export Corporation(PSIIEC) is in the process of setting up common effluent treatment Plants at Phase VIII, Industrial Focal Point, Ludhiana separately for electroplating and dyeing units. Welcoming the pre-election sops announced by Finance Minister Jaswant Singh, Mr Tulsidas Jaitwani, president, Punjab Beopar Mandal, today urged the Central Government to abandon the idea of implementing VAT in all states of the country. Bonn Nutrients, the manufacturers of Bonn bread, today organised a lucky draw in connection with a gift scheme of the company. The draw was taken out by Dr S.S. Johal, Vice-Chairman, Punjab Planning Board. Hi Bird Cycles, which has bagged International Quality Award, held its first dealers’ conference here today. 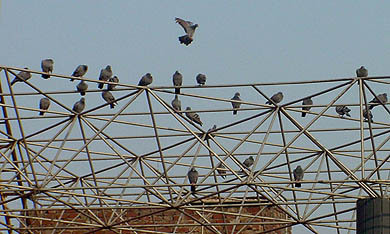 The all-India conference was held after two years of launch of the bicycle in the domestic market. January 10 is celebrated as International Inner Wheel Day, as on this day in 1924, the inaugural meeting of the Manchester Club (Great Britain) was organised by the first-ever Ladies wing of the Rotary and the name Inner wheel was adopted. A doctor examines teeth of a kid at a camp organised to mark International Inner Wheel Day at Ludhiana on Saturday. Left-arm spinner Sushyant Kohli, who yesterday scalped five for 12 runs to enable Sanatan Vidya Mandir Senior Secondary School, Civil Lines, to record an easy 53- run victory over SDP Senior Secondary School, Hazoori Road, took five wickets for 22 runs to steer his team to a comprehensive win by 95 runs against Government Model Senior Secondary School, Punjab Agricultural University, in the Parle-PCA Inter-School Cricket Tournament (u-17) played at the Satish Chander Dhawan College for Boys ground here today. 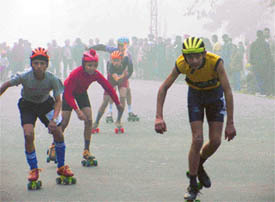 Skaters from Ludhiana and Sangrur proved their supremacy over others in the road races in the 15th Punjab State Roller Skating Championship which concluded at the Leisure Valley,, Sarabha Nagar, here today.